Mormon Mommy Writers and Friends: Happy Anniversary to YOU! Throw away your crazy pills cuz you're not nuts and you're not alone. And we are starting this blog to reassure ourselves that we're not the only crazy ones out there. Okay, so we know we're crazy--lol! 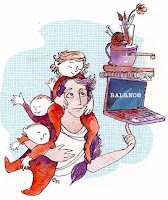 But it would be helpful to know there are other moms out there who wanna break into the publishing business too! So if you hear voices in your head begging you to tell their story while wiping faces and juggling Relief Society assignments, then we are the right blog for you!! Come along and enjoy our zany adventures as we take the publishing world by storm and still manage to get dinner on the table by ten. Well, since that post, Jenni has taken the publishing world by storm. (She never does anything halfway! Oh, and did you notice that she even admits she's crazy??) Today we will be giving away THREE prizes!! 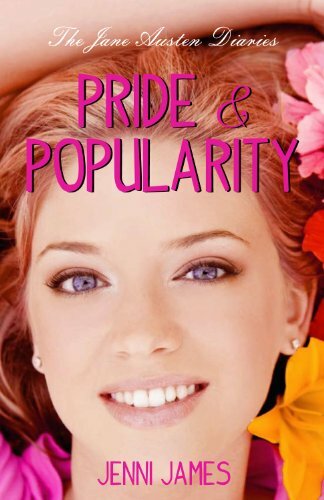 Of course we have to give away a signed copy of "Pride and Popularity" by Jenni James! This book is wonderfully cute. My reluctant reader of a daughter read it in one day and didn't come up for air!!! Our next giveaway is from H.B. Moore. She was one of the first people to ever comment on our blog! I remember when I realized a real life author commented on our blog. I was so excited I emailed her right away and asked to interview her on the blog. She was MMW's first guest interview ever!! So I felt it only appropriate that one of our giveaways today be a signed copy of "Ammon" by H.B. Moore!! Watch the book trailer below to find out more!! Heather B. Moore’s "Ammon" is a delightful combination of vibrant characters and epic drama. Moore seamlessly clothes historical giants like Ammon and King Lamoni in flesh and blood, making the story leap from the page and captivate readers. Carrying nothing but hunting weapons and the promises of God, Ammon secures a position as King Lamoni’s servant in the land of Ishmael. Miracles come to life as Ammon faces the challenges of being a Nephite prince in a Lamanite land. Moore provides insights into the spiritual and physical realities of Ammon’s plight and mission, emphasizing the magnitude of his sacrifice and service. Elena’s fair-skinned family of Nephite heritage struggles when Ammon’s message threatens the foundations of Lamanite culture. Torn between her growing affection for Ammon and her father’s insistence she marry a wealthy Lamanite, Elena weighs the expectations of her people against the promptings of her heart. Moore’s genius with character development paints a Lamanite people rich in traditions and passionate in beliefs. She depicts the brutality of the time period without garish scenes of violence. This fictional retelling of factual accounts is enthralling, intense and unforgettable. The page-turning, adventurous pace of the book doesn’t ebb but is balanced by moments of reflection and compelling plot. 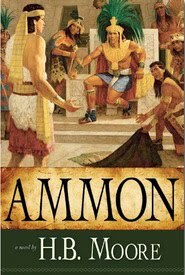 "Ammon" is the latest in a series of Heather B. Moore’s historical novels based on the Book of Mormon. However, "Ammon" more than stands on its own as a complete story in itself. Other books in this se ries are "Abinadi," "Alma" and "Alma the Younger." The last giveaway today is our own e-book, "Totally Cliche"! We are working on making it come out in print as well! And when we do, you can bet on a blog post on why it's taking so long to do so!! For those of you new to our blog, here's a brief synopsis of the book we made from a short story contest held right here! 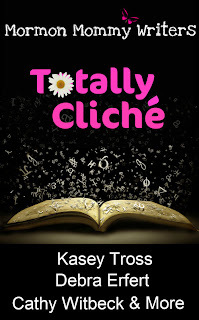 "Alice in Clicheland" by Kasey Tross - What's a writer to do when all she can think of is cliches? Perhaps visit Castle Cliche in Clicheland where all IS as it seems! "Scared Stiff by Debra Erfert - Sammy is a girl that has never been scared her entire life despite her best efforts. Will that all change on a dark and stormy night? "Mirage" by Cathy Witbeck - Leslie's mother was killed twenty years ago, yet when her mother's previous employer seeks Leslie as their newest employee, she may be headed for the same fate. So there you have it! THREE giveaways today!! That means there will be THREE winners!! Now, how do you win? Come back throughout all of January for amazing giveaways or view our sidebar to see what is coming. Happy Anniversary to you ladies! What an accomplishment. I am now following Heather and now I am also following Jenny and I am a follower of your blog also. 3 entries? Awesome. I hope I win all three! Love your website. Happy Anniversary! I've been wanting to read Pride and Popularity for a while. I'm a follower of the blog and Jenni's blog. I have Pride & Popularity in my to-read queue. Now adding Totally Cliche! Can't wait! Congrats on three years of zany fun, sisters! I remember hearing a lot about "Ammon" and really wanted to read it. Thanks for the giveaway! They all look like awesome books! What a great give-away. I can't believe I haven't bought this one yet. Love, love, love entering contests, especially when it's because people are celebrating. Congratulations on your 3rd anniversary. I'm a follower of your blog--and now of Heather's, and now of Jennie's, and I posted about this on my blog, and announced that post (and your anniversary) on my Facebook page. Whew . . .
What an exciting journey - and I love anniversaries! (of any type). I've added your blog to my list - I am definitely following this one! Happy anniversary! What a great achievement! So excited to join this fun and brilliant group of women. I've been writing stories, poems and articles for years now, but haven't had the courage to do anything more than share them with family and friends. You are all so inspiring. I'm hoping to absorb some of your courage. Happy Anniversary! I am interested in winning The Pride and Popularity book.